A variation on a theme: the Lover’s Knot. For centuries, this has been used in rigging by sailors, the merging of two ropes extending the use of one by merging it with the other: a knot that makes the bond stronger. 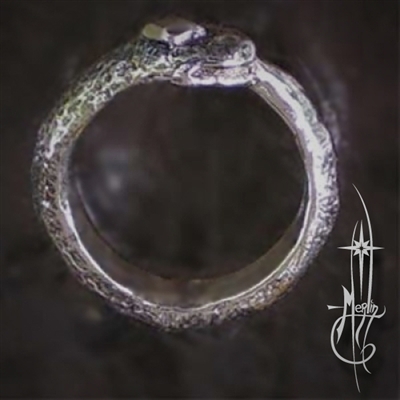 In the Traditional Lover’s Knot Ring, I developed the design as a promise ring, hand fasting or wedding ring. I have used the same knotwork pattern in the creation of the Handfasting Bracelet. Some have decided they like the idea yet wanted something a little different, so I designed the knot to be more “Celtic”, using the traditional knot work approach illustrated in the book of Kells. The weaving “in and out” says the same thing: two become one, their strength is greater than the sum of it’s parts; a metaphor describing how a couple’s commitment may strengthen each others’ lives. This Celtic version of the Lover’s Knot is woven “in and out” providing a more dense look to the design. By following the strands that wrap around the band you can see that the “two (chords) are one”. 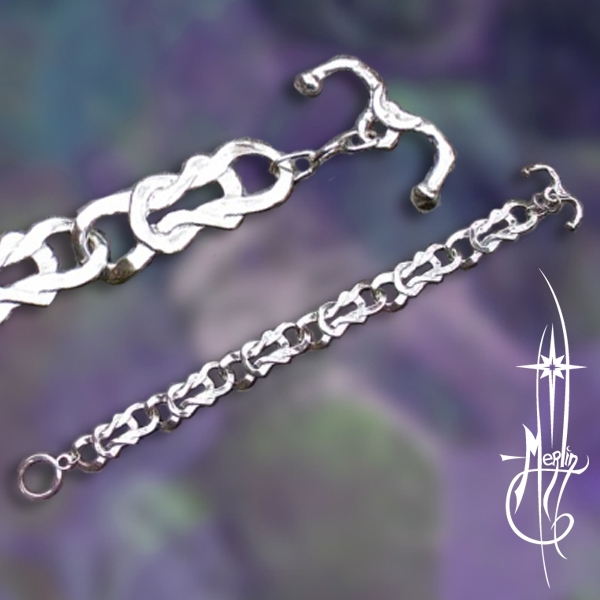 This design has been used to symbolize the “wedding knot” for centuries and used in “handfasting”: a promise to be true “for a year and a day”. If you would like to have this ring made for you, don’t worry about sizes, each is made as they are ordered to allow for the right size and the possibility of inscriptions to be made on the inside of the band. 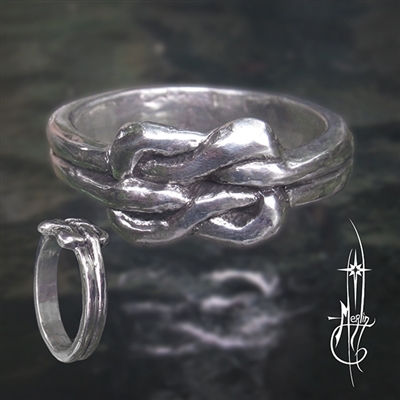 Simply go to my web page featuring the Celtic Lover’s Knot Ring. something he could use at his Masonic Lodge. he decided we go ahead with the project. 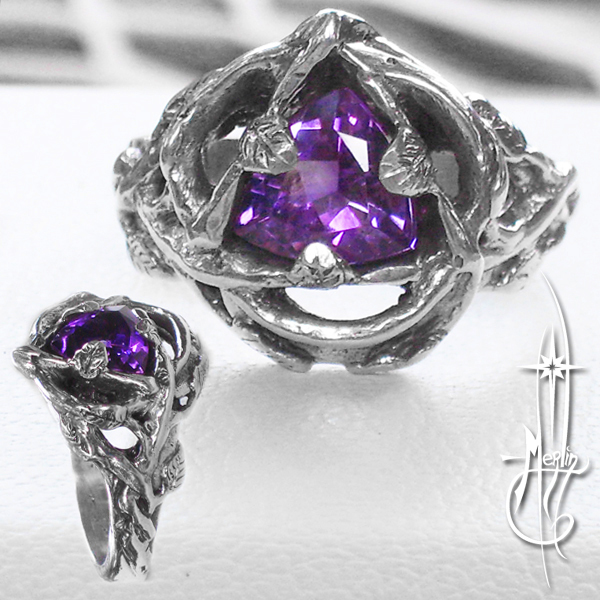 carved in wax and using the lost wax process cast in sterling silver. the the compass and square laid over the top and crowned with the classic “G” in the center. The ring was built on a classic shank which smoothly fits the hand. omitting a chance of breakage for years of wear. or the top design of the Masonic Symbol. 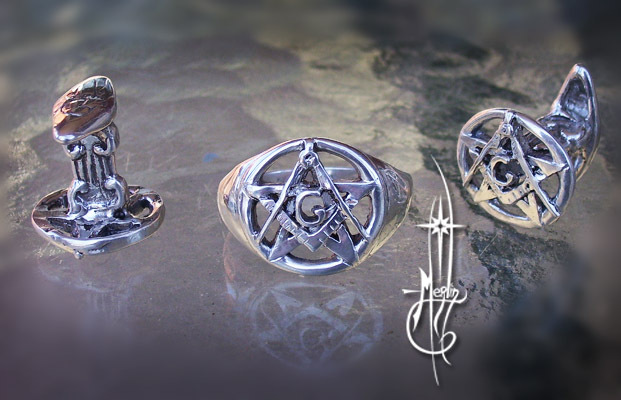 “I really like the ring and cuff links I had specially designed. the evening he received them. please go to my How to order custom jewelry page. however this is my favorite. 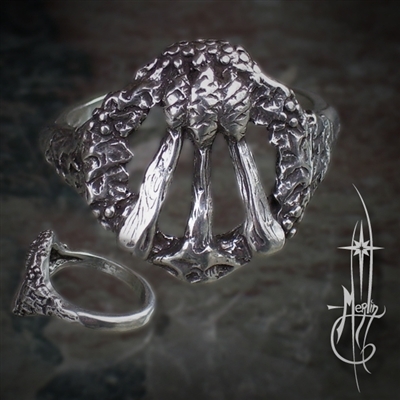 as a ring with a leaf pattern for the shank. one can see images like faces in the leaves. 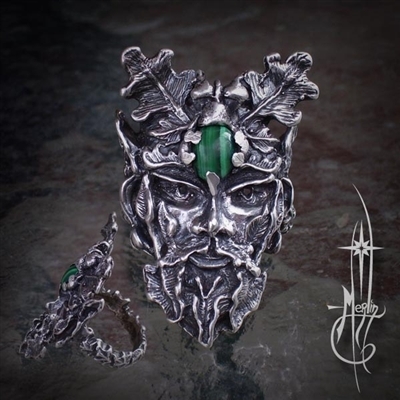 that “face” was said to be a vision of the Green Man. lore has it spoken of the Green Man through out the legends of Arthur. bedecked with acorns and leaves. I used malachite as the forehead’s stone. I also brightened the leaves I used for the setting. also available with lapis lazuli or Carnelian. it will be made specially for you. the face is 1 3/8” from leafy beard to the top. an ancient symbol of a serpent swallowing its own tail. the Ouroboros has been found in cultures through out the ages. beginning anew after each cycle. It symbolizes the circular nature of their work. lightly textured and smooth for comfort. providing the recipient to request unusual sizes. Would you like this ring modified?